With only two full days to discover Lisbon we felt we barely scratched the surface and we definitely left the city wanting more. There are so many fabulous neighborhoods to explore, but we had to make choices and we chose Belem! Per our usual modus operandi we got up late and ended up grabbing a coffee and a pastry to go. Wanting to explore a bit more of the city we decided to walk part of the way to Belem along the river path. After a while the path seemed to end, so we cut up through the neighborhoods and discovered some fun design shops, a great food market and some pretty neat street art. Not sure if the fish were biting, but that’s a lot of poles to keep track of! First on my list upon arriving was the Padrão dos Descobrimentos or the Monument of Discoveries. The monument stands as a testament to Portugal’s past and their part in world exploration on the seas. Perched on the edge of the Tagus River the monument stands just over 179 feet high and provides amazing views of the Belem neighborhood, Jerónimos Monastery, the 25 de Abril Bridge, the Cristo Rei statue, the Torre de Belém and of course the river itself. The observation deck is on the very top and although the views are tremendous there isn’t much room so it’s hard to linger. There is an elevator available, but Simon and I decided to walk up the stairs. Not sure what we were thinking?! The cost to go up is minimal and I’d say it was worth it! The square in front of the monument is dominated by an enormous compass rose made of black and red limestone. It’s an incredible work of art with many detailed symbols which represent the main routes of Portuguese exploration in the 15th and 16th centuries. I did my best to get an ariel photo, but even at 179 feet up I wan’t able to get it all in! 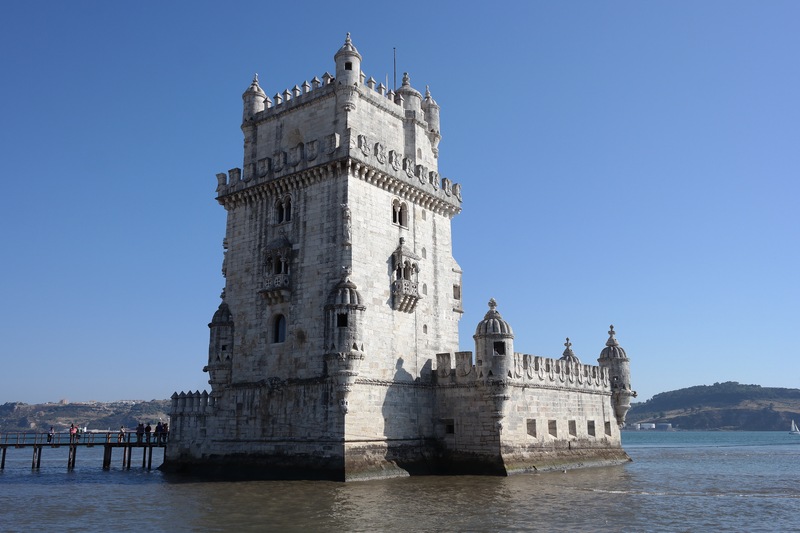 A short walk down the river from The Monument is the Torre de Belém or the Tower of Belem. There is a military and maritime museum inside the Tower, but our time was limited and we decided not to go in. The Tower, located just offshore in the Tagus River, is accessed via a short elevated walkway. Because of its role during the Age of Discoveries the 500 year old Tower is a UNESCO World Heritage Site. It was built not only as part of the city’s defense system, but also as a ceremonial gateway to Lisbon. It’s quite an impressive piece of architecture and we spent some time just admiring the view. Can you tell there is a hot dog and fries under all that cheese?! Across the street from the Tower and the Monument is the Jerónimos Monastery. Building started in 1496 and finished a century later. I read that the monks of the Order provided spiritual guidance to seafarers. These are the same monks who created Pasteis de Belem or Pastel de Nata the most famous of all the Portuguese desserts! Elliot loved these baby ducks swimming in the fountain! Speaking of wandering… Once the Monastery had closed we visited the famous Pasteis de Belem located just across the road and then spent some time wandering through the streets of Belem before we decided to give the kids a break and head somewhere just for them… Oceanário de Lisboa! Another great post about Lisbon! We really enjoyed our visit there and would have loved to stay longer! Now you have more time to plan! Isn’t it! When I saw that compass rose in the guide book I just knew I had to get a photo from up top! A bit hard to fit it all in due to it’s immense size… It’s a tight fit up top, but worth it!